Clay Station members have exclusive use of the well equipped workshops at the Omega Centre at specific times throughout the week, including weekdays, evenings and weekends. 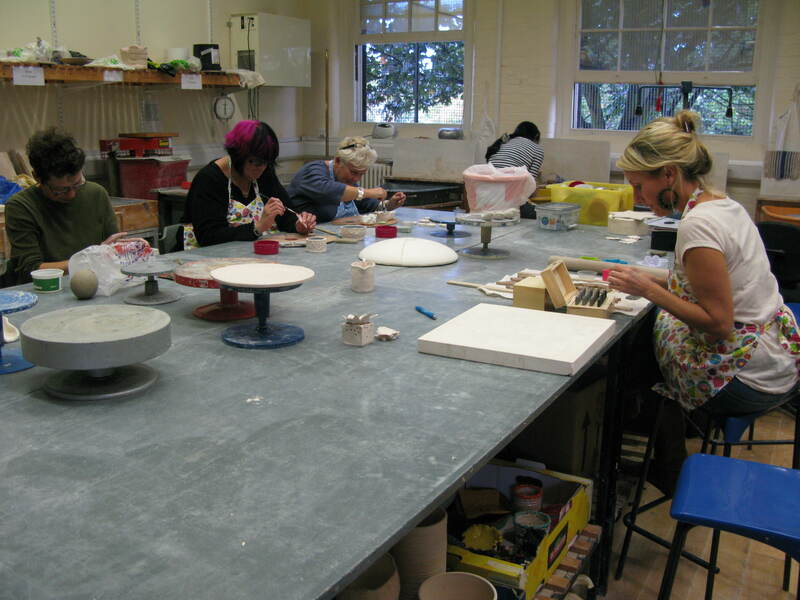 During these times, there will be an experienced ceramics tutor on hand to help and advise. The Clay Station studio is a great place to work with a supportive network of makers willing to share their knowledge and experience with each other. The membership fee allows us to maintain and replace equipment in our studio. We currently have a wide range of equipment including 4 electric potters wheels, 2 kick wheels, slab roller and 3 large electric kilns. We can arrange private hire for parties or events or ‘bespoke’ courses for groups … please email us for details. A small charge is made for the clay, glazes/materials and firing which is calculated on the quantities used (Weigh and Pay!). We aim to keep all our fees as low as possible. All the Clay Station team are volunteers and as a non profit organisation all profits are reinvested into the organisation. Our aim is to provide enthusiastic makers with an inspirational and creative space in which to work. If you are interested in becoming a member of Clay Station please contact us at clay.station@mail.com. To join Clay Station you should have experience of working with clay or have completed one of Clay Station’s courses. Visits to view the workshops and discuss membership are also welcome by arrangement. Great idea! My degree was in ceramics and education (35 yrs ago…) and I’m delighted to find that there’s somewhere local with the equipment to let me dabble again. Just wondering what workshops you might have coming up for complete beginners?! This course is for complete beginners and for those who need a refresher course! Hand building techniques, sculpture and throwing on the potters wheel will be included in the course. Sessions are taken in our fully equipped friendly and relaxed studio. Please contact to book or for further details. There is also a throwing 3 day course £120 Weekend of the 22nd/23rd October and November 5th. Both are suitable for beginners! Hi Ashley we have a beginners course Wednesday evenings Nov 2,9,16,23,30 6-9 pm cost £100 including materials and firing. Please email us at clay.station@mail.com if you would like a place, we are nearly fully booked so do contact us on that email address as soon as possible.